Spread ingredients over parchment paper on a roasting pan. Add a small dollop of your choice of fat onto each wedge of cabbage and onion. Sprinkle generously with sea salt and place in the oven for 30 minutes. After 30 minutes, remove from oven and separate a few layers of the onion and spread out on the pan. 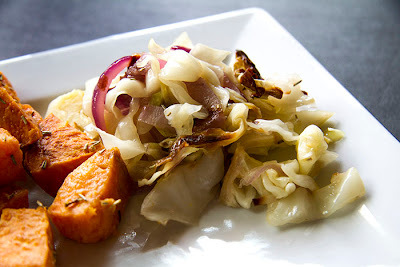 Give the cabbage a turn and place in the oven for another 20 - 30 minutes. Depending on your oven temperature, you can periodically check to make sure your goods are not burning. When done, remove from oven and allow to cool for a few minutes. Finely chop each wedge of cabbage and onion and place into a large bowl. Squeeze out roasted garlic from their skins and add to your sliced cabbage and onion. Add apple cider vinegar, honey and rosemary and toss all ingredients until well combined. Season to taste and enjoy!